My Yatra Diary Goes International! and A Real Bond: An Ode to my Grandpa – Post for Kissan. Remember them? Well, it gives me immense joy and happiness to inform you all that I won prizes in both of them! And the icing on the cake is that both of the prizes pertain to traveling, or we could say.. yatras, that too for free! While expedia gave me an all exclusive 6 days fully paid trip to Japan – one of the most beautiful countries in the world, Kissan presented before me a tough choice list of 6 off beat places in India to choose my destination from. Out of the two, my Kissan yatra will still take a bit of time going, but the Expedia yatra is well underway and I am all set to fly to Japan very very soon! Yay! Japan, it was and boy, if I wasn't delighted! PS: I am busy with all the preparations and stuff like that, and hence not getting enough time to visit all your blogs. Kindly excuse me for the same. hope u will have a very nice time in Japan... wish u a safe and happy journey!!! This is fantastic, Arti! And so well deserved! I am so excited and thrilled for you!! Bravo!! Have fun Arti! We look forward to hearing tales from your travels when your back! Hi Arti! If it is the wishes that got you the prizes, you deserved every one of them for having been a friend to newbies on blogosphere. I believe, however, that you deserved the prizes for the quality of your entries (read the Kissan one - the expedia was before i joined Indi). All the best for your international yatras and Bon Voayage. Oh dear! you are going places... now Japan and then another place of your choice!!! Congratulations!!! How exciting! I hope you will return with lots of pictures from Japan!!! Let us know when you have decided on the other country. Arti, congratulations on winning both prizes. Enjoy your trip to Japan. My best wishes are always with you..Lots of love! happy journey! Have a wonderful yatra to Japan. Have a Super dooper trip to the land of the rising sun! hey, this is great!! congratulations!! i remember reading that post and my comment should be there somewhere :). 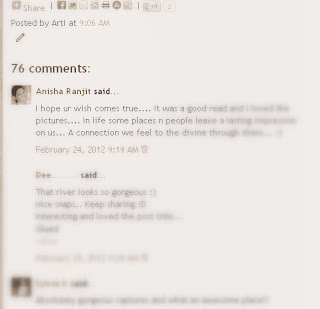 Dear Arti, oh my, i am so happy for you! Congrats girl, you deserve it and will make the most of these trips! I do remember your entries - they were magical! Love for a rich and adventurous time! I am so happy for you Arti!!!! Congratulations and my best wishes--I know there will be sweet stories from you as a result of these trips!!! Hi Aarti, nice to hear that you are going on a trip of your life. Wow, Japan!! Congratulation. You truly deserve them. Wishing you a happy and safe journey and a fun-filled stay in Japan.... you really deserve this and much more!!! Will surely miss you... waiting for those crispy posts about Japan :) Enjoy the holiday!! Whoa !!!! Am so happy for you Arti :) I hope you have a great trip abroad and come back with great stories and beautiful photographs from your brand new camera. Congratulations Arti, that is wonderful and you must be thrilled. Have a great time in Japan and look forward to hearing about your trip and seeing your photos. Have a blast . Hope to go on virtual tour of japan . Congratulations Arti! This is wonderful! Wish you a great time at Japan ,and yes do bring us loads of pictures and stories. (Because of a health problem I was on a break from my online life). Awesome Arti, you are a true traveller and truly deserve it!! Enjoy Japan and the other place you'd be choosing! wow.arti..My heartfel congratulations! enjoy the trip! Of course I wish you all the luck in the world. Have fun and we'll see you soon. Congratulations and that Kissan Entry was heart warming. Enjoy! Wow! Congratulations and all the best for the trip. I can't wait to read about Japan on Yatra diary. I'm so excited for you. Have a safe trip. Have fun. congrats...... for your happy journey..
Congratulations Arti. The reasons why you won are because your writing are beautiful. Well done. Enjoy you Yatra and keep us updated about it as well through your blogs. Wow, thanks for sharing nice info, i like yours post. Have fun Arti! Most of us had predicted this prize was yours for taking, remember? Have a great trip! Looking forward to a sensational epilogue when you reture. Congratulations arti.. hope to read much about Japan.. its my dream country.. do write in detail about every aspect - culture, people, festivals, art, etc.. have a nice time there... Sayonara! Congratulations. You deserve the prizes. As you said there is so much good stuff written by Indibloggers that reading itself is a BIG pleasure. A very happy journey to you! oh this is huge! congratulations Arti. I only wish I could shrink myself down and ride along in your suitcase. Japan, yes one of the most beautiful spots. Oh, I truly look forward to seeing it through your eyes. Safe travels to you. oh wow, congratulations, so happy for you, this is so wonderful and thanks so much for sharing this inspiring experience. @Arti Many many Congratulations.Great.We waiting for read about your Japan Yatra. All the best.Take Care. Congratulations, Arti! I knew it, the first time I set my eyes and mind in your works through this site, I knew you will go places. Your works are always extraordinary. पढकर मन प्रसन्नता से भर उठा. बहुत बहुत हार्दिक बधाई आपको. Wonderful, wonderful news, Arti! Much congratulations on your accomplishments. Can't wait to see Japan through your eyes. Hearty congratulations and safe travels! Expecting to hear about the trip! Heartiest Congratulations! You deserve all the success and I am so so happy for you. David and I will be in India Nov 1-15 and would like you to dine with us in Delhi on Sunday Nov 4 in the evening. I have also invited Kavita, Ruprekha, and Ramakrishnan. So far, Kavita has said yes. This dinner will be paid for by David and me. I hope to meet you then. Oh my my my !!! Congratulations Arti, you rightly deserved it. I will be waiting for your post about Japan. Wow! Great . Have a great trip and will check your blog for details of your trip. Long time, no post, I hope all is well. Eagerly waiting for your post about the trip to Japan..